The Fitzpatrick family is one founded on hard work, community service, and philanthropy. This successful husband and wife team are well known for their generosity and commitment to community. 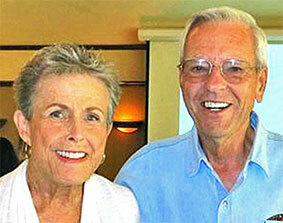 Through the years, the Fitzpatrick’s have supported Mercy Hospice and Pediatric Care at Mercy Redding. They were major supporters to Mercy Medical Center Redding’s Emergency Department Renovation and Expansion. In addition, Betty is a founding member of the women’s donor society, the Catherine McAuley Circle. “It’s important to have high quality care here,” Betty said. “As you grow older, you appreciate being taken care of in your own community.” She recalled that she and John were invited to tour the existing emergency rooms and to review the renovation plans. “When I saw the project and the rooms – it was really appealing and we knew we wanted to help,” she said. In 2015, the couple became the primary supporter of the $9.9 million Stroke and Vascular Advancement Project, which will bring new technology into four hospital suites that treat stroke patients and those with other life-changing medical challenges.